This is just going to be a quick post: the n key on my keyboard is still broken, so every typing becomes a bit tedious (or trying to replace with words without the 'n'). I finished a few of my paintings and, in the process of formatting photos for the almost ready website) redid some photos that were still missing. 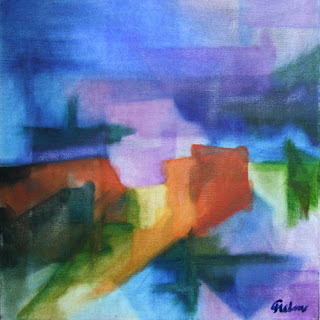 It was one where I tried to use the technique Lyonel Feininger used by applying geometric shapes and wiping back the oil colours before applying the next layer. This link should take you to Google's image search of his pictures - look out for his 'Vogelwolke', which is one of my favourites and his Gelmeroda series. It made me laugh - the text on the back emphasised the drama in the sky in contrast to the uneventful landscape - I was really intrigued to what let him paint the cumuli clouds in such a naive manner. 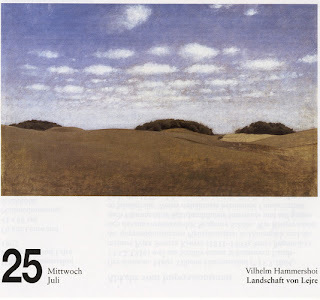 I found a retrospective of his a few years back at the Hamburger Kunsthalle, with most of his paintings being intricate interiors. This site here shows some of them, as well as another landscape. ... sounds much more glorious than this unsuspecting lump of mid-value grey that's drying on the shelf. 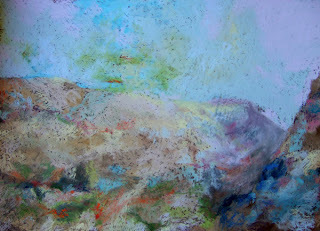 I've been collecting pastel dust from my paintings at home - less in an attempt to extend the lifetime of my beige cheap carpet (if anything, I'm looking for an excuse to replace it) but more in hope that all the greens, blues, purple, reds and yellows would come together in the end to make a neutral pastel stick. Yesterday then was the day: I had collected cool and warm shades separately but the jar with the cool ones looks suspiciously similar to the vastness that is my Blue-Green-Earth Unison set ... I don't quite remember why I bought that set now, but I haven't really used it much at all. After mixing both cool and warm dust and grinding it with pestle and mortar, I added distilled water and rolled it into shape and it's been drying since. This is the really simple way of making your own pastel - the binder that keeps the pigments together and determines degree of hardness/softness is gum tragacanth - yet, in the pastel dust, it is still contained and does not require anything other than merely adding water. 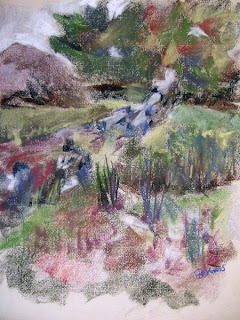 There are various instuctions on making soft pastels online - ranging from the complex ones like in this article by Phyllis Franklin on Wetcanvas to rather straightforward ones such as on the Earth Pigments website (who also supply, to North America, a glorious range of Natural Earth pigments). One of the few UK suppliers of the binder is the long established Cornelissen and Son in London who supply a wide range of traditional pigments and specialist artist equipment. - and more recently as part of my research into the desert sands and how natural iron oxide colours them in a variety of hues from gold to violet. For the latter, I've come across the Clearwell Caves Ochre mine in England which also supplies fine ground ochre pigment from yellow to an unusual deep purple for painting purposes. That dark purple looks great - and it looks pretty close to one of my favourite dark neutrals I've been using. Yet - somehow I feel that this isn't the kind of activity that my kitchen surface would welcome... yet another reason to look for some studio space, I suspect! I kept working on the oil this afternoon and only then went back to have a look at the photos I took - the pastel is very loose and the colours are pushed far away from the original sap and light greens to add more impact. 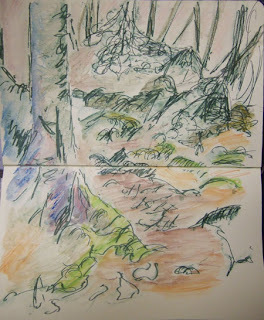 The pen and wash sketch was the last of the three - going back to the original composition. From these first three ones of the same scene, I can now go and simplifying and abstracting further - both with oils and pastels. ... my bags are packed for a week of outdoor painting up North. I've prepared about 10 panels for the pastels. Some of them have splashings of acrylic paint on top, I hope to use them for some detailed close-ups. The weather has been pretty bad recently, so rather than lemon yellow, the last batch got Payne's Grey for colours. I reckon that should work pretty well for low clouds and rain in the Scottish Highlands. I've also packed all my other things: oils, acrylics and drawing materials - a holiday is a holiday is a holiday - and it would be a shame if I really wanted to use the oils and not have them with me, wouldn't it?! 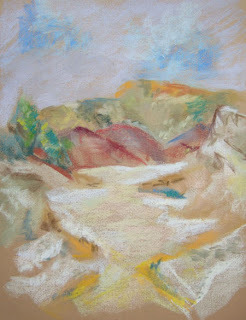 Mulling over, looking through and eventually just making a start with desert painting series by going back to the photos and sketches I made on site at the Coloured Sands in the Makhtesh HaGadol, south of Dimona. I captured one of the main views on site, as mentioned in this earlier entry here - but before I feel I can go back to do that as a painting, I need to 'get to know' the location again. Just as well that we took lots of photos in addition to the sketches. Many of these are detailed shots of different small rocks, sand dunes and larger vistas. 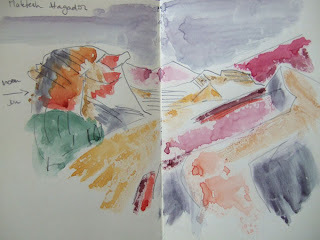 With my sketchbooks ready prepared I've made a start with more frequent drawing here and there. One of the books is in my bag now, but taking it out and drawing is a different matter still. Partly, because drawing people is something I'm not really good at - even if they are sitting still, let alone when moving. Nonetheless, I've been doing sketches on lemons and stones at home. For the latter I've been looking for advice on simplifying form, identifying planes and establishing light and shade. 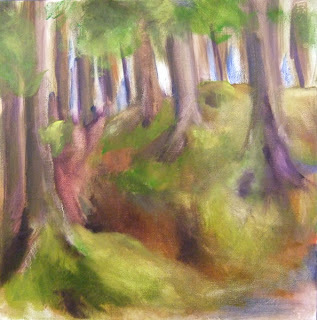 Well organised in a series of exercises she develops highly detailed and realist drawings of skies, trees, rocks and water. 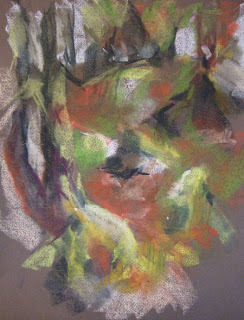 Drawing and Sketching forum on Wetcanvas - a large and very active online Artforum. In their classroom section, there are numerous exercises on improving one's drawing and observational skills. The introduction, Basic 101 Class 1 offers the starting point for a whole series of different tutors presenting a series of exercises around one drawing challenge. Another artist who has a great range of drawing (and painting) lessons on his extensive website is the late Charles Sovek. His Lessons from the Easel are an excellent resource in which he passes on his extensive experience on the basics of drawing line, tone and contour and more advanced questions of composition. Just for good measure, here is a drawing I did quite some time ago... with more recent ones to follow soon, now that my holidays are finally here. I made up another batch of pastel supports over the weekend. I experimented a few different ways of making my own boards after I found that ready-made boards where both rather expensive but also too even in surface for the kind of texturing I was looking for. For the past few paintings I've been using large sheets of simple grey boards cut in half, so that I end with a good sized 50x70 cm boards. I gesso these with simple white emulsion twice, then add a layer of equal parts emulsion, pumice powder for texture and water with a broad brush, sand this down if I want a smooth board or leave it with broad brushstrokes if I want a stronger texture, and finally paint a top layer of acrylic paint, pumice powder and water (again equal parts). The colours I've mostly used are lemon yellow, raw siena or raw umber, but my last batch also included some muted green (still trying to find something for Scottish summer landscapes) and warm yellow ochre. 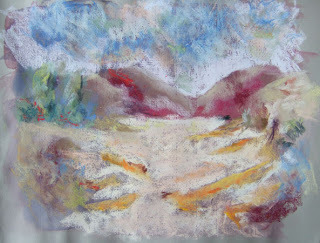 I had planned to work on a series of landscape paintings - mainly in pastel, when I had come back from Israel in Spring. 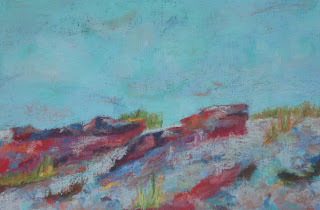 I started with exploring colour ranges and different underpaintings to get a feel for the desert in Spring. This is one is so far the only one colour study for this. A few weeks of holidays are coming up. For the first week I'll be going on an organised outdoor painting spree in the Highlands. Very much looking forward to it, I've started to get organised. Until recently, most of my art attempts outdoors were restricted to sketchbook, pencils and some watercolouring for colour reference. Yet, a few weeks back I went up to Ardnamurchan with a friend for a gloriously sunny long weekend. I had been to Ardnamurchan a few years ago, and remembered how beautifully remote it was. With all that sunshine the beaches were glowing and so were the Hebridean Islands in the background. 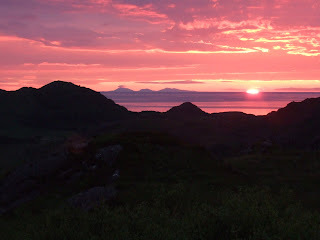 This one below is from the place we stayed, at 10.15 pm westward with the sun setting behind the Outer Hebrides. 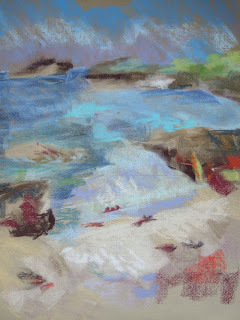 We had a car and I ended up lugging most of my art equipment with me - and I was glad I did. 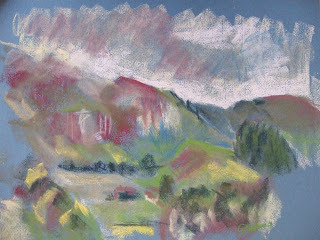 I had plenty of time for sketching - quick 20 mins sketches on 30x40 cm coloured pastel ground. 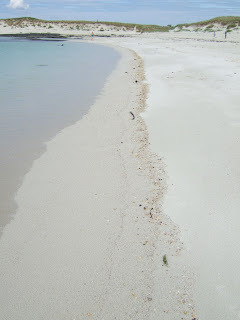 This is one of Sanna Beach outwards - I didn't even have to exagerate the turquoise in the water. 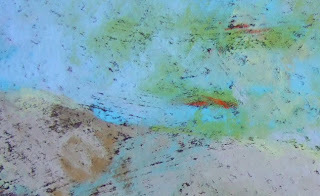 One of the books will be on textures and detailed patterning - to take forward some of my pieces on wallmarkings. The other one will be on colour studies. On the basis of that first painting for which I used lemon yellow as base colour, it is going to be lemon yellow (or: Hansa Yellow), based on PY3 pigment (Monoazo Yellow, Arylide Yellow) that I will start to research and experiment with for this month. I've been using a Moleskine sketchbook for travelling - while the sizing of the paper took some getting used with watercolour washes - which I use mainly just for colour reference, I now started to quite like the effects of it, and went and bought a couple more to organise thematically. 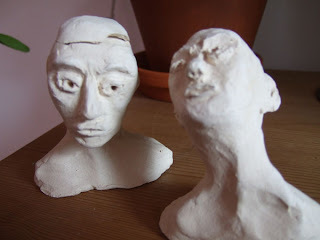 I've been shying away from life drawing until recently - too complex for me, but working with clay and sculpting people, or heads, was pretty exciting: adding a bit here or there changed the whole expression in a much more involved way than adding lines, texture or shade on a drawing can do. 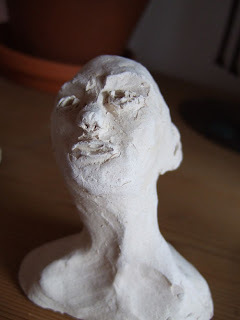 Note to myself: do sculpture again, soon. It's a new range by Alison Borthwick, called Poppy - white glazed. delicate porcelain with stylised poppies placed across. This is a small coffe cup, and there's plenty more in the shop. When we drove to the pottery I remembered that when I was in Scotland for the very first time in the mid-1990s I went up to the Orkney Islands, visiting a friend who was working there over the summer - it was a dry and very warm summer. I took lifts off people across the mainland, met many different folk - a retired diver who would salvage ship wrecks off Scapa Flow, and two elderly sisters who for the past twenty odd years would come to Orkney with their car for their annual holiday from the Shetland islands. At that time I had just started studying for a social science degree. But that week up on Orkney - which for me was pretty much at the end of the world back then - left me wanting to find a pottery in the North or West of Scotland and make vases, dishes and much more and nothing else. More than 10 years on I still don't know how to work with a potter's wheel, let alone make evenly shaped vases... I suppose that that's for another time.